The other day I posted a study of a white lily where I focused on maintaining a consistent cool light. The areas being struck by light were cool white- titanium white with a hint of blue. Areas in the shadows were not only a darker value but also a warmer temperature. This principle of warm light, cool shadows and cool light, warm shadows is one that is often challenging for artists. I have had several instructors, authors, artists that I trust and are highly experienced give conflicting messages on the topic. Some swear by this principle and say that it is a law of nature and must be observed and followed and others have debunked it. So I decided to do some experimenting for myself. On a practical basis, the question comes up for me, less when painting outdoors because there I just go with what I see, but more when I'm setting up a still life and have to figure out am I/should I be using a light of one temperature or another? I've had instructors who only use cool light because it simulates natural "north light" which is apparently more consistent and another instructor who was equally as masterful who works only with warm light for her still life set-ups. Today I did a version of a lily similar to my last post, but maintaining a warm light with cool shadows. It is pictured above. I slightly revised the background of the Cool Light study from the other day so that is now pictured below. So what are my conclusions so far? Whether or not this is a law of nature (and I'm tending to come out on the side that it is), I think picking a temperature for lighting your subject and maintaining that is a good practice as the uniformity of the light temperature can give your painting overall harmony. (Imagine a more complex still life where you had inconsistent temperatures, my guess is it would be harder to discern the forms, light and shadow). Either lighting seems to work for producing convincing form. I personally enjoyed doing the warm light, cool shadows version more, but I think that is because I'm used to the notion that objects in sunlight would have a warm cast and shadows would be cooler and bluer, reflecting the sky. Think of a white house in sunlight with blue/lavender cast shadows under the roof line/eaves (and a bit of contrasting warm bounce light reflecting up from the sunlit ground plane below). In the version with the warm shadows I had to keep thinking about how to get warm dark shadows without automatically reaching for ultramarine blue to darken things (which would of course cool them too). As far as which I like better, it's hard to say. The white in the cool light actually looks whiter, more vibrant, when I compare them side by side in person, but I am kind of partial to the warmer more sunlit look of the warm light version. I'll continue to explore and be mindful of these temperature differences moving forward. What are your views on this warm light vs cool light debate? any perspective you'd like to share. Feel free to click on comments. I'm planning on doing a large painting which includes lilies so decided to do a small study of just one lily to familiarize myself with the shape, form and colors. In this one I choose to use cool light and warm shadows. For a comparison I thought it might be interesting to try the same thing over with warm light and cools shadows. Once I do that study I'll post the 2 of them together so we can learn abut the differences. I have a new art exhibit entitled "Take Me Away" opening this Saturday night, January 25 at the ART Station in Stone Mountain, GA. This is the front and back of the invitation. The show's theme is based on the premise that art can "take you away". Art has the power to transport you to other times and places even if just for a few moments as you are taken on a visual journey in your mind and imagination. Twenty eight of my paintings, both oil and watercolors, will be displayed from 1/25 through 3/30. Paintings feature landscapes of France, Lake Louise Canada, Bermuda Ireland and of course Italy among other places. The opening on Saturday from 7-9:30 is free and open to the public. All are welcome to attend. I will also be available for book signings at the event. 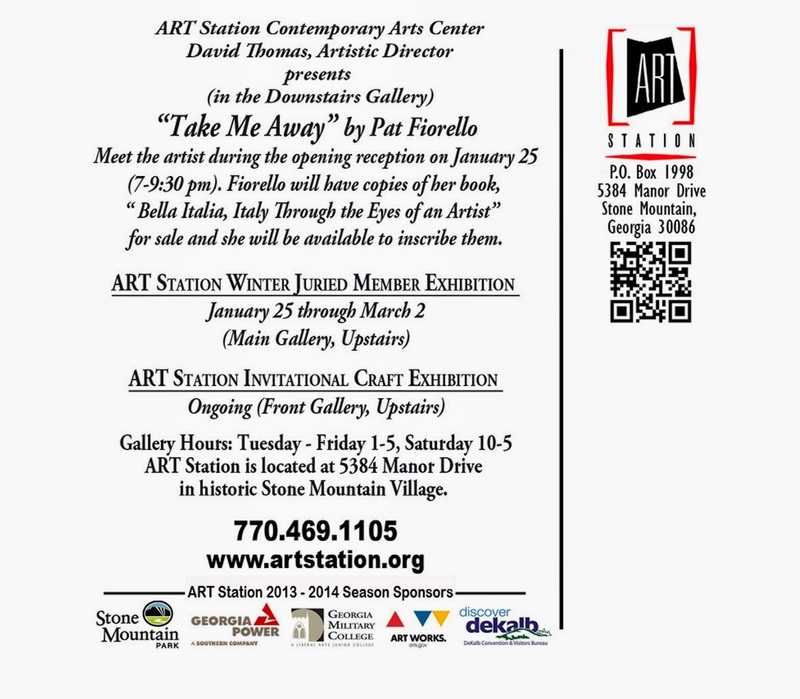 The ART Station is located at 5384 Manor Drive, in historic Stone Mountain village. This event coincides with the January Art Stroll in the village. My first large painting of the year. I had seen this grouping of white roses in Tuscany and had taken a photo. Finally got to paint them. My aim in this one was to get a sense of a lush garden with depth and roses coming out into the light. Concentrated lots on varying hard and soft edges and warm and cool colors. Fort those of you in the Atlanta area, you are invited to a talk I'm giving on Monday 1/20 at the Atlanta Artists Center. Invitation is below. The talk is on "Travel & Art Perfect Together" . It is a program which is part of the monthly AAC meeting, but even if you are not a member, you can come for free as a guest. I'll be talking about the top 10 reasons to combine travel & art as well as what you might want to consider when selecting a workshop. AAC Is Celebrating 60 years! first meeting of our 60th year! Long-time member and former AAC Chairman, Pat Fiorello will share the benefits of combining travel and painting from her 20 years of experience both as student and as an instructor. Pat's painting travels have taken her to France, New Mexico, Bermuda, Canada, Ireland, The Virgin Islands and Italy among other places. 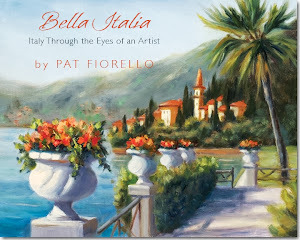 After the talk there will be time for Q&A and Pat will be available for a book signing of her newly published book Bella Italia, Italy Through the Eyes of an Artist. 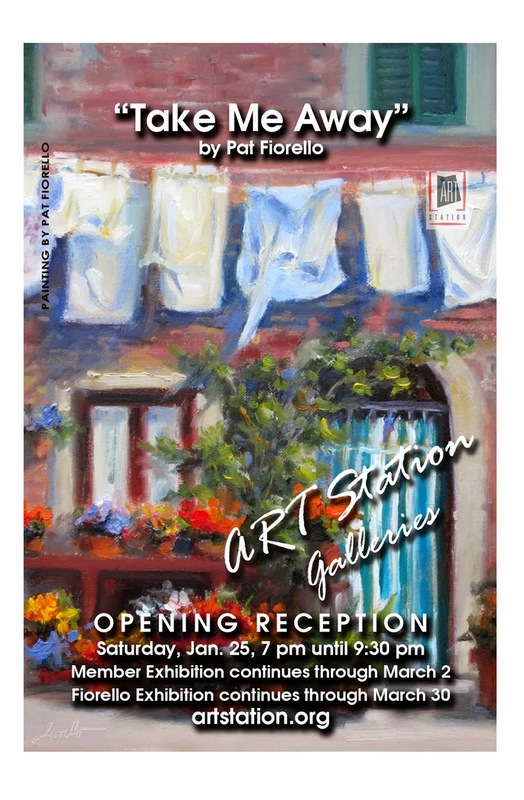 Pat Fiorello is a professional artist and art instructor known for her impressionistic landscapes and floral paintings in oil and watercolor. Inspired to make the expression of beauty a higher priority in her life, in 2002, she left a successful 20-year career as a Marketing Vice President with major corporations including The Coca-Cola Company, and made a life change to become a full-time artist. Pat's paintings have been in numerous juried shows and more than 20 one-woman exhibits. Her work has been licensed for greeting cards and home décor products and appeared in the book Splash 11, The Best of Watercolor, published by North Light Books. She is a Signature member and past president of the Georgia Watercolor Society. I spent New Year's Eve and New Year's Day in Charleston S. C. this year. The eve happens to be my birthday so I was happy to be in one of my favorite places with one of my favorite people (my husband). We stayed at a place we hadn't stayed at before, the Frances Marion Hotel, a historic hotel right on Marion Square. The hotel dates back to 1924 and has lots of classic architecture, decor and special touches. It was beautifully decorated for the holidays. 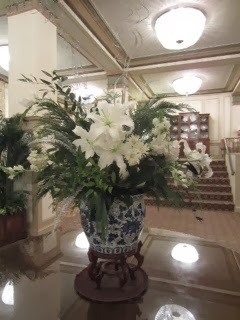 Of course I couldn't resist the beautiful floral arrangements so snapped an iphone photo of this one in the lobby. The photo is not the best of photo references, especially since the lighting is really bad for a painting, but it was enough of an inspiration to do a small study from which I plan to do a larger, more complex version. With the holiday travel and other activities I haven't painted in a few weeks, so it took something to get back in the swing of things. To "reboot", the other day I decided to start with a small study just 8 x 8 pictured above. Happy New Year to all! Hope your holidays were good and you're looking forward to some new possibilities in 2014. Been a little quieter than usual on the blog last month with holiday travel and this painting was a Christmas surprise so I didn't want to share it till after the holiday. This was a commissioned painting I did for one of my favorite clients. I did a painting for her earlier this year and she wanted me to do another one as a surprise gift for her husband for Christmas. 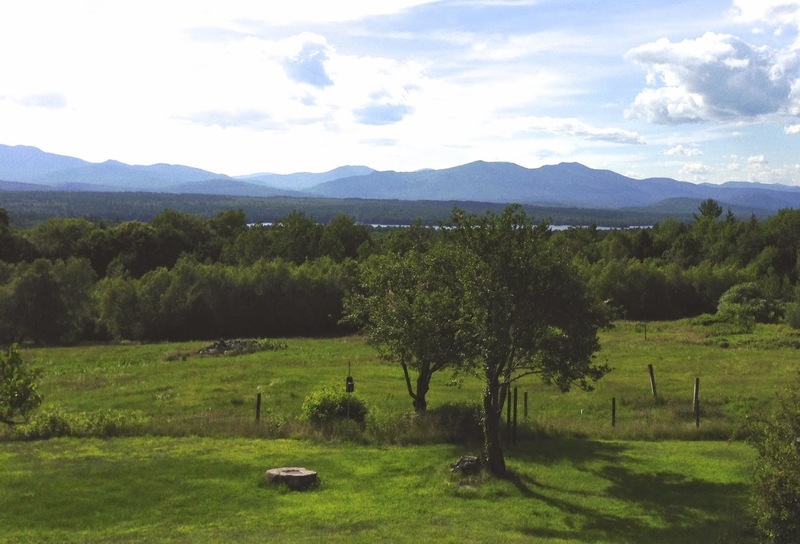 This is a scene from the yard of his childhood home looking out to Mt. Washington, New Hampshire. The photo below is the only reference we had to work with so it took quite a bit of artistic license to change the season, alter the composition, to make more of the mountains, reduce the foreground and make more of the river as a light shape but still keep the feel of the place he remembered growing up. 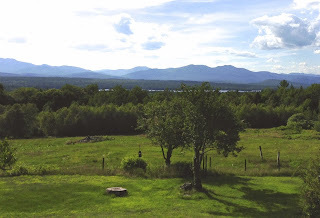 Mt Washington is the most distant mountain in the scene.